The Pandora Immo is the latest immobiliser to hit the UK. You can't see the device due to it being hidden completely in the vehicles wiring loom. All you have is a small ADR tag that sits on your vehicles keys. If this tag is not within range the vehicle will be immobilised and it won't allow you to start the engine. Once the tag is within range of the vehicle it will allow an engine start. This system also has an anti hijack feature meaning if you are hijacked from your vehicle the system will start looking for the ADR tag, if this isn't found the Pandora Immo starts it's countdown timer. Once this starts the vehicle will come to a slow stop after 30 seconds. This allows you to be at a safe distance from the hi-jacker. Allowing you to recover the vehicle once the thief is out of sight. The Pandora Immo can't be cloned or key scanned like other devices on the market meaning you are buying a security product that will offer excellent protection. 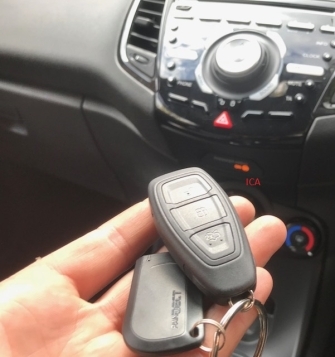 These are ideal for customers with vehicles that want protection but are not looking to have an additional alarm installed. We are Pandora Platinum dealers located in Essex.